Considered by critics to be the “most expressive” design in the career of famed American architect Frank Lloyd Wright, the iconic Beth Sholom Synagogue in Elkins Park is not only a National Historic Landmark, but also a culmination of the architect’s vision and continued evolution. Of the more than 1,000 structures Wright planned over 70 years, the place of worship with an active congregation on Old York Road is the only synagogue he designed. 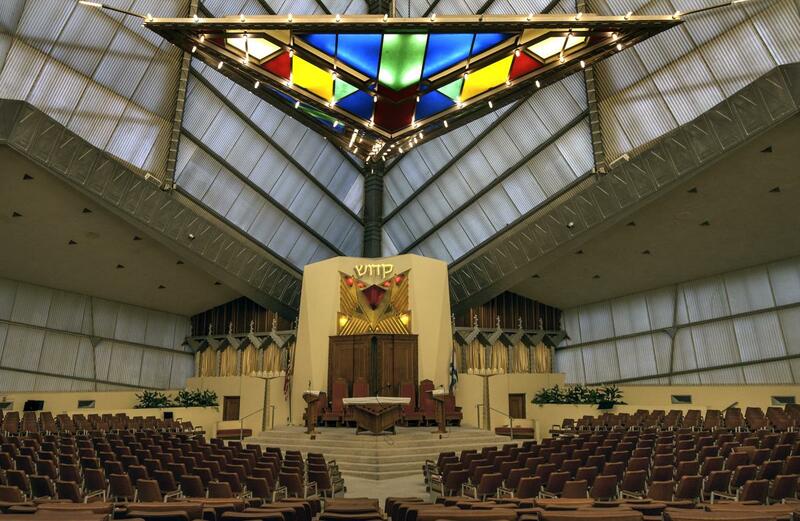 Built in 1954, Beth Sholom is Hebrew for “House of Peace,” and an important work of American architecture. That’s why people from all over the United States and 68 countries have passed through its doors. Visitors can take a guided tour led by volunteer docents several days a week, watch a documentary film about the building, and explore the visitor center with a multitude of exhibits about the building, architect, and congregation. When Rabbi Mortimer J. Cohen approached Wright in 1953 to create the synagogue, Wright wanted to give congregants the sensation that they were resting in the hands of God. In fact, each element of Wright’s design was carefully crafted with a contemporary approach to Jewish faith, history, and religious practice. The Mayan Revival style building is layered with symbolism from the mountain-like silhouette suggesting the ascent to Mount Sinai, to representations of Menorahs, and even the stone tablets given to Moses. 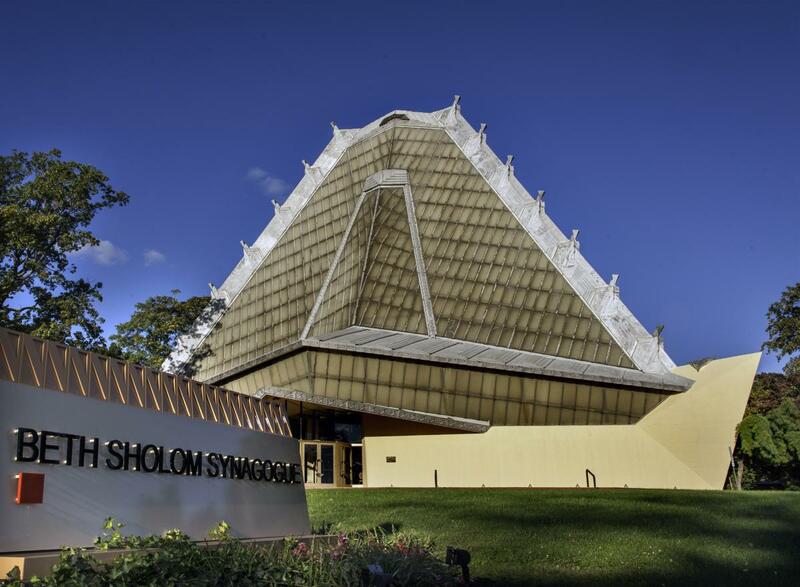 Beth Sholom’s more than 1,000 seats are horseshoe-shaped on a gentle slope for the best view. Suspended from a 160-ton steel tripod frame, the main structure creates an open space, free from internal supports. The pyramidal roof consists of a double layer of sanded white glass that fills the inside with natural light, day or night. 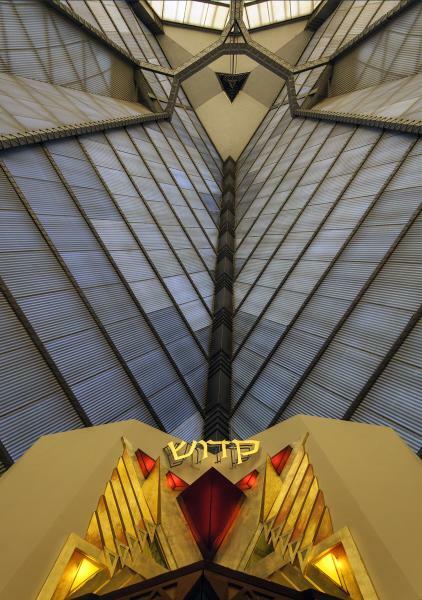 Dedicated in September 1959, five months after Wright’s death, his design has been described as a distinctively American architectural idiom for a Jewish house of worship.